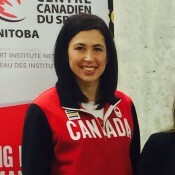 As a child, Jill Officer could often be found hanging around at one of Winnipeg’s many curling clubs with her mom, who was a coach for young curlers. Growing up as a part of the curling community prompted Jill’s beginning in the sport at the age of 10. A few years later, Jill started playing with Jennifer Jones as a junior athlete, and has played second with Jones (almost) ever since. The two have now been playing together for almost 25 years. Jill’s success in curling has been exemplary all the way along, with five Scotties titles, a World Championship and an Olympic gold medal. Jill sees the Olympics as the pinnacle of sport, and says her most memorable moment in sport was winning gold with her team at the Sochi Winter Olympic Games in 2014. Outside of sport, Jill loves to travel and enjoys the outdoors – camping and hiking wherever her travels take her. In 2006, she trekked for 27 days in the Himalayas and made it to the Mt. Everest Base Camp. Today, Jill continues to dominate the curling world with her team. She hopes to capture another world title and another Olympic gold medal in the future. She and her husband live in Winnipeg, MB with their young daughter. What she loves about curling: The traveling, the people and the precision. WINNIPEG SUN (Oct 19) Yes, drug testing is the necessary reality of becoming an Olympic curler. But it can get rather inconvenient. GLOBAL (Oct 13) When I last left you in March, I was mourning the upsetting loss our team had at the 2016 Canadian Scotties Tournament of Hearts in the semi final game.